I'm not an overprotective or helicopter parent, but sometimes it's better to hold a hand and save a life or keep a little distance from danger. My kids are tweens now and we still have a firm keep your feet on the ground rule at zoos, on precipices, and on all man made or natural high drops with railings. Better safe than sorry may be cliche but it's too true. The week before last, we were at the Cincinnati Zoo with the family and had THE coolest chance to see endangered snow leopards hand fed through a mesh gate. There were a number of young children within arms reach of the carnivores and I've got to say it made me nervous. In a split second, any one of them could have decided to "pet the giant kitties" and lost their fingers or worse! Sure the zookeeper "handfed" them but he was a trained handler and even he made sure to keep his fingers well away from the talons and teeth. He admitted the leopards couldn't tell where the ground cow ended and his digits began! The parents were all farther from the kids than the cats were and that freaked me out a bit, even though they weren't my kids. Sure, everything was all hunky dory, and nobody lost any limbs, but would it have really hurt the kids to back off a bit? Where were their parents, and were they really 100% sure their kids could handle look but don't touch?! All people are not that bright. Kids may be smart, but not aware of the dangers. Even adults arguably old enough to know better....don't. It's 2012 and there are still signs in our national parks not to feed or tease the bears. Grown adults have gotten mauled trying to pet them and get close to pose for photos. Every time we visit a zoo I see a zillion kids standing on the animal enclosure railings, horsing around and jostling each other for a closer look. As sick as it is, I'm kind of surprised more of them haven't been eaten. Like Snow Leopards, wild dogs are endangered and happen to be my 9 year old's all time favorite animal. She ADORES them and plugs wild dog in every Mad Libs noun spot every time we play. She always wants to see that exhibit first when we go to a zoo that has wild dogs. I've been sheltering her from the macabre accident Sunday because I hate to squelch her love and excitement for African Painted Dogs, especially since they're an endangered species, and particularly rare and precious. I don't want wild dogs to be forever linked in her mind and imagination with a grisly zoo accident. Yesterday, Sunday, November 4, a child fell 14 feet into a zoo exhibit with a pack of wild dogs and was killed. I can't even imagine the grief, horror and helplessness of the mother, friends and onlookers. My heart goes out to this little boy and those who loved him. This is a tragic accident and I'm sure there will be plenty of blame, guilt and nastiness as the result of this toddler's death, rippling out across social media and beyond. Already, harsh comments are popping up, calling for the mother to be charged with murder and imprisoned. Hasn't she already suffered about the worst punishment a mother can? If she did indeed set her 2 year old boy on the railing, I think she's learned her lesson the hard way and highly doubt she would EVER make that mistake again. I'm waiting for the onslaught of "The dingo ate my baby." Seinfeld jokes to begin. The dogs were just being....well, wild dogs. There are many larger predators at zoos that would have done the same, and as sad and horrific as this is, I wouldn't necessarily hold it against a large cat or polar bear if the boy had fallen into their enclosure and died instead. This was nature...predators and prey. This wasn't murder or malice. It was a tragedy...an awful accident. I don't know how the events exactly played out or how a two year old got over a 5 or 6 foot high fence and bounced out of a safety net below. I know toddlers can move extremely fast and things can go horribly awry in a few seconds. That said, even now that my kids are tweens, I keep a close eye on them at zoos and remind them of animal etiquette and safety. (ie: Do NOT approach or pet strange dogs without asking their owners). The toddler was visiting the Pittsburgh zoo with his mother and friends and "fell off an observation deck that's about 14 feet above the exhibit and was killed by the dogs," according to Barbara Baker, president and CEO of the Pittsburgh Zoo & PPG Aquarium. For now, the Pittsburgh Zoo and aquarium are closed until Tuesday and the African Painted Dog exhibit is closed indefinitely. One small boy and one highly endangered African Painted Dog are both dead. What will this mean for public sentiment for one of the most most endangered dog species in the world? What will this mean for the Pittsburgh Zoo's breeding program? There are less than 5,000 African Painted Dogs left in the wild, according to the zoo. Pittsburg Zoo has a breeding program and ten African painted dogs were born there in 2009. The mother died of a ruptured uterus shortly after delivering the litter, zoo officials say. Five of the pups survived. The dogs are about as big as medium-sized domestic dogs, 2 to 2½ feet high and 37 to 80 pounds, according to the zoo. 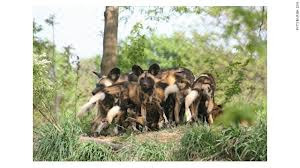 African wild dogs are also known as cape hunting dogs, spotted dogs, and painted wolves. They have large, rounded ears and dark brown circles around their eyes and are considered endangered. There were 11 dogs in the exhibit and each is about the size of a small German shepherd, zoo officials said. "Our emergency teams and our Pittsburgh police responded immediately, but there wasn’t anything that could be done," she added. "Unfortunately, the dogs were in pack mentality and not responding,” zoo officials stated in a written statement. The Pittsburgh Zoo and the associated PPG Aquarium are closed until further notice, according to CNN. Police and the Allegheny County medical examiner’s office were investigating. Baker said the zoo, which has never had a visitor death, plans an internal investigation, and no decision has been made yet on the future of the exhibit.